A few days before I left for Lisbon, Portugal, I started wondering whether I should have chosen an alternate location for vacation. I didn’t know much about the culture of Portugal, and I had only learned a small bit of Portuguese. Weirdly, it’s something that happens a lot: right before a vacation, it’s second-guessing time. As it turns out, it wasn’t language or culture that I had to worry about. Instead I should have been concerned about all the hills. There’s a reason that Lisbon is called the City of Seven Hills, and “hill” is perhaps understating the issue. Everything seems to be at the top of a steep incline, and even going downhill feels like it’s walking uphill. The flight from Philadelphia to Lisbon is six or seven hours long, and my husband and I managed to snag coach seats on the very first flight of the season on my husband’s airline (the Lisbon flight is seasonal). It was a non-rev flyers dream: 50 unsold seats, so we had a whole row to ourselves. The flight had only minimal turbulence and passed quite quickly. Lisbon is a wonderful city in terms of public transit from the airport. The red line of the metro picks up right at the airport and will get you into town in about thirty minutes or so. 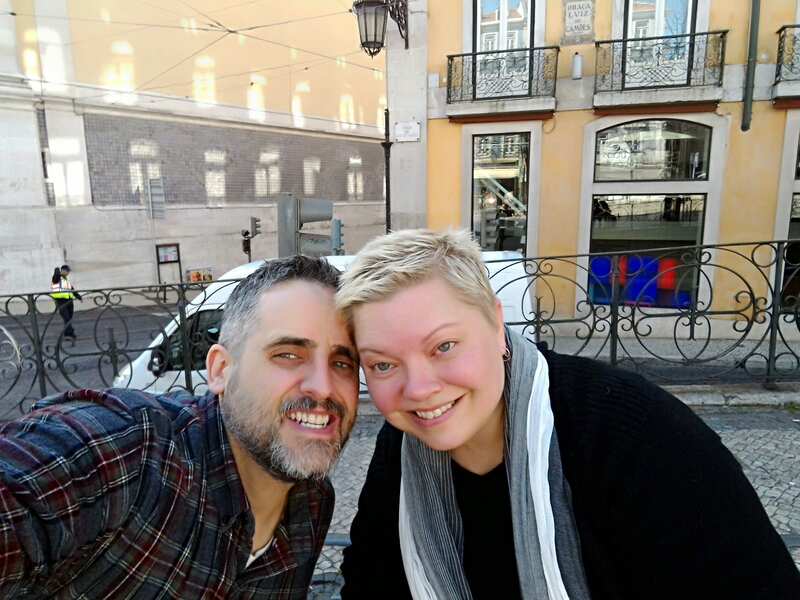 We rented an Airbnb apartment in the Barrio Alto neighborhood, so we transferred to the green line at the Alameda station and took the train to the Baixa-Chiado station. So, here’s where I discovered the sheer horror of Lisbon hills. It’s always a bit difficult to orient yourself in a new city, right? Had I any sense of direction whatsoever, I would have known not to exit the station toward Baixa, or the lower town. 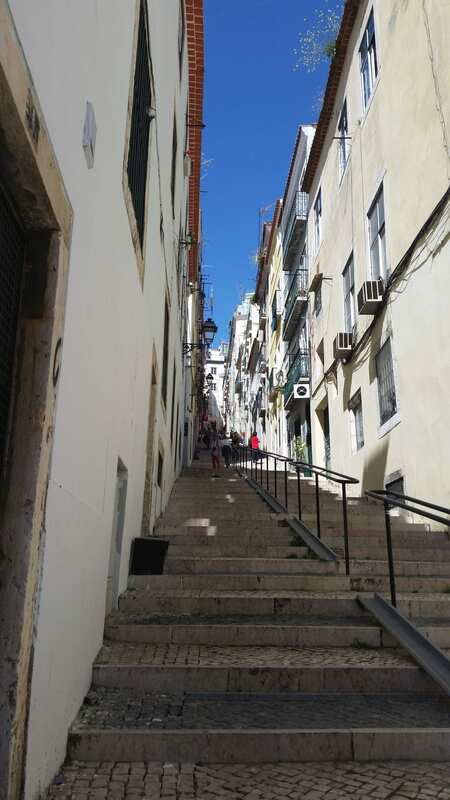 But yeah, that’s what we did (instead of taking the three or four escalators up toward Chiado, or the upper town), and it necessitated Craig and I hiking up a million sets of stairs and hills, blindly following the tiny Google Maps arrow on my phone. We finally reached Camões Square in the upper town, and I had to sit down and take a freaking break. I was sweaty and gross and tired and kind of delirious. But that wasn’t the end! Oh no. Our apartment was up another two blocks on a very steep road. And then up five flights of stairs. I considered never leaving the apartment. You can visit Europe and never leave your apartment, right? Right? That all sounds pretty hideous, and maybe like I hated Lisbon. In truth, I love Lisbon. I loved our apartment, five floor walk-up notwithstanding. I loved the Barrio Alto area, too. I got all sorts of ideas for a new novel. In fact, there was nothing about Lisbon that I disliked, other than I had to leave after five days. 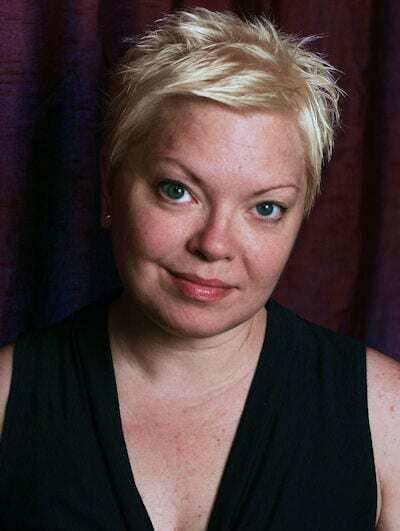 Language–obviously, the language is Portuguese. I learned a little bit of Portuguese (numbers; polite words; how to ask for a beer, a table for two, a glass of wine, etc), and I’m glad that I did, but I also found it very difficult to learn. Duolingo offers only Brazilian Portuguese, and there’s a big difference between Brazilian and European Portuguese. I have a basic knowledge of Spanish, so I thought maybe it wouldn’t be totally dissimilar, but Portuguese pronunciation is a bit hard. All that said, everyone I spoke to under the age of 35 knew at least a little English, and most of them knew English quite well. Older people tended not to know any English or very, very little. Also, we took a cab twice, and neither driver knew English. The moral of the story: if you don’t learn any Portuguese, be sure to have the address of anywhere you want to go written down to show your cab driver. Restaurants–there’s a lot of seafood in Lisbon. A lot. But there’s also tons of other types of food–Portugal was certainly in the empire business once upon a time, so there’s a thriving immigrant population in Lisbon. Almost every restaurant we went to, no matter the neighborhood, the menu was also translated into English and sometimes French. We went to a few higher end restaurants, but we found the food to be much better and far less expensive at smaller places (tascas). Our favorite was a place about three blocks from our apartment, called Bar Nelson. Two dinners of whole grilled and fresh caught fish with vegetables, fresh bread, fresh and aged cheeses, and a small jar of wine (about four glasses worth) for maybe 25 euros, tops. Pasteis de Nata–These pastries (sort of like creme brulee in a crust, but without the hard sugar topping) are everywhere. Everywhere! Most guidebooks will recommend heading to the Belem neighborhood to a place called Pasteis de Belem, which makes the oldest de nata recipe in Lisbon. That said, a local recommend Manteigaria, which is maybe a block from the Chiado side of the Baixa-Chiado metro station exit. 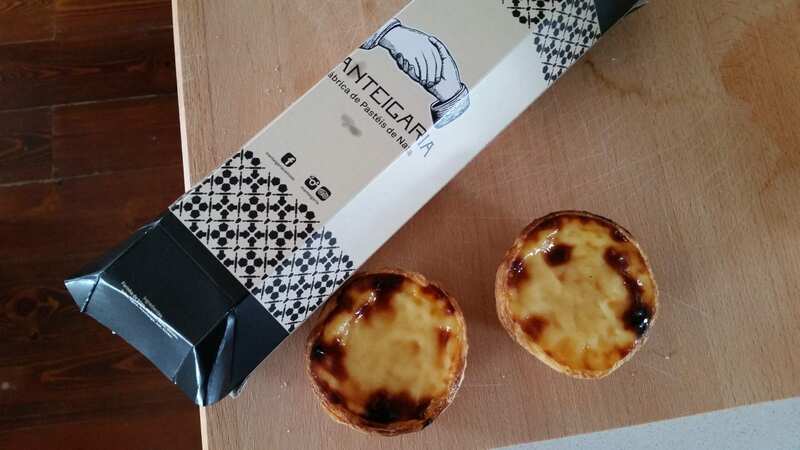 The de natas from Manteigaria are stellar. They’re like a euro per de nata. Public transit–as I mentioned, the metro is great and easy to use, but it doesn’t go all the places you might want to go. There are also trams, both modern-looking trams (more like what you might see in Houston) and absolutely ancient trams (like the original street cars in San Francisco). The 12 goes to Belem along the waterfront, and the 28 runs through a few different neighborhoods, including Barrio Alto; we took the 28 up to Castelo de Sao Jorge. There are also elevadors, which are short-distance trams that connect the lower town to the upper town. They generally only travel about three blocks, but they’re totally worth it to avoid hiking up steep staircases. And there’s also an actual elevator–the Santa Justa lift–that connects the lower town to the upper town, plus the escalators in Baixa-Chiado metro station. There are also buses, but we never used them. I highly recommend getting a handle on the public transit to save you hiking, climbing, etc., and your legs and feet will thank you for it later. Oh, and buy a 50 cent Viva Viagem card at any metro station–you can load it up and reload it with 10 or 20 euros worth of transit that works on the metro, trams, elevadors, and elevators. A good map that shows the locations of all that (except the buses) is the Streetwise map. We were sad to return to the States after a fantastic five days, but the good news is that we loved it so much we’re sure to return. I’d love to spend some time in Porto and Colares, maybe even spend another day in Sintra.